Compact in size but big in features, Cuisinart’s countertop Griddler offers five-in-one functionality as a contact grill, panini press, full grill, full griddle, and half grill/half griddle. The stylish brushed stainless-steel housing looks sleek and modern in the kitchen and features a wide panini-style handle and a hinged floating cover that adjusts to various food thicknesses. On the base, two temperature controls and a function selector are clearly marked and have indicator lights for quick reference and accurate, no-guesswork operation. Open the cover and customize the cooking surface with removable and reversible nonstick grill and griddle plates that snap in and out easily and drain grease to an integrated drip tray for healthier cooking. The Griddler also comes with gourmet recipes and a cleaning scraper tool. The cooking plates, drip tray, and scraper all go safely into the dishwasher. Limited three-year warranty. The Cuisinart Griddler is actually five appliances in one. A hinged, floating cover and one set of removable and reversible cooking plates turn the Griddler into a contact grill, panini press, full grill, full griddle, or half grill/half griddle. Dual temperature controls and indicator lights make this product easy to use. Dishwasher-safe plates, integrated drip tray and a cleaning/scraping tool make cleanup fast and easy. Once you have finished cooking, turn the selector dial control to the Off position and unplug the power cord from the wall outlet. Allow the unit to cool down for least 30 minutes before handling. Use the cleaning/scraping tool to remove any leftover food from the cooking plate. The scraping tool can be washed by hand or in the dishwasher. Dispose of grease from the drip tray once cooled. The drip tray can be cleaned by hand or in the dishwasher. Press the plate release buttons to remove plates from the housing. Be sure that the plates have cooled completely before handling (at least 30 minutes). The cooking plates can be washed in the dishwasher. The housing base, cover and control knobs can be wiped clean with a soft, dry cloth. For tough stains, dampen cloth. Use the Griddler as a contact grill to cook burgers, boneless pieces of meat and thin cuts of meat and vegetables. The contact grill function works best when you want to cook something in a short amount of time or when you are looking for a healthy method of grilling. When cooked on the contact grill, food will cook quickly because you are grilling both sides of the food at the same time. The ribs on the grill side of the plates, combined with the grease spout at the rear of the plate, allow the grease to drip from the meat and drain off the plates. When the Griddler is used as a contact grill, the grill side of plates is recommended. Rest the cover evenly on top of the food until it has reached the desired cooked temperature. The Griddler was designed with a unique handle and hinge that allow the cover to adjust to the thickness of the food. You can easily grill anything from a thinly sliced potato to a thick sirloin steak with even results. When cooking more than one food item in the contact grill, it is important that the thickness of food items is consistent so the cover will close evenly on the food. 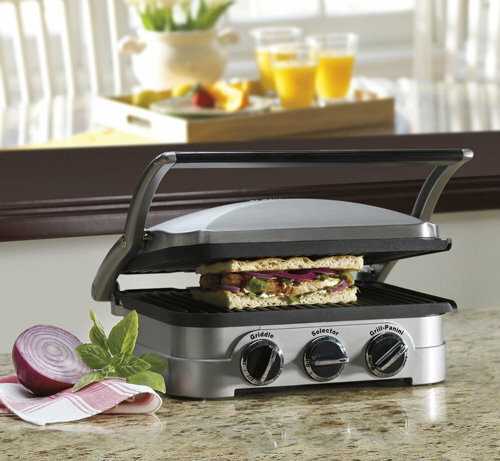 Use the Griddler as a panini press to grill sandwiches, breads, and quesadillas. The sandwich is pressed between two grill or griddle plates to toast the bread and warm the sandwich. We recommend using fresh-baked bread to produce the best tasting panini. When the Griddler is used as a panini press, the grill side of the plates is recommended. We recommend the grill side of the plates because traditional style panini sandwiches have grill marks on the bread. However, depending upon the type of sandwich you are preparing, you may wish to use the griddle side of the plates or any combination of the two. The Griddler functions as a panini press in the same manner that it functions as a contact grill. The Griddler was designed with a unique handle and hinge that allow the cover to adjust to the thickness of the sandwich you are preparing, and to rest there evenly. Light pressure can be applied to the handle to press and heat the sandwich to your liking. Use the Griddler as a full grill to cook burgers, steak, poultry (we do not recommend cooking bone-in chicken, since it does not cook evenly on a full grill), fish, and vegetables. Full grill refers to using the Griddler with the cover lying flat, creating a double, flat cooking surface. In this position, the foods you are grilling will have to be turned over for cooking. When the Griddler is used as a full grill, the grill side of the plates should be used. Cooking on the full grill is the most versatile method of using the Griddler. With the full grill, you have double the surface area (200 square inches) for grilling. You have the option of cooking different types of foods on separate plates without combining their flavors, or cooking large amounts of the same type of food. The full grill also accommodates different cuts of meats with varying thickness, allowing you to cook each piece to your liking. Use the Griddle as a full griddle to cook pancakes, eggs, French toast, hash browns, and breakfast meats. When you use the Griddler as a full griddle, open the cover so it lies flat, creating a double, flat cooking surface. In this position, the foods you are preparing will have to be turned over for cooking. When using this cooking function, the griddle side of the plates should be used. Cooking on the full griddle is a wonderful way to prepare breakfast for two or for a large family. The large surface area allows you to cook a variety of different foods at the same time, or large amounts of your favorite food. Use the Griddler as a half grill/half griddle in order to create full meals like bacon and eggs or steak and potatoes at the same time. When using the Griddler as a half grill/half griddle, simply place the unit in the flat position and insert one plate with the grill side facing up and another plate with the griddle side facing up. This cooking option allows you to use either the grill/panini temperature or the griddle temperature selector. Adjust the Griddler to the flat position with the controls directly in front of you. Insert one plate at a time. Each plate is designed to fit in either the upper housing or the lower housing of the Griddler. If you are facing the Griddler, the drip spout should be at the rear of the plate. Locate the metal brackets at the center of the housing. Tilt the back end of the plate and line up the cutouts at the back of the plate with metal brackets. Slide the plate underneath the brackets and push down the front end of the plate. It will snap into place. Turn the Griddler around and insert the second plate on either its grill or griddle side into the upper housing as you did with the first plate. Cuisinart products are designed to make life delicious all day long. Specialty items, like the Griddler, offer today’s consumers a variety of menu options, and fun and easy new ways to entertain family and friends. Cuisinart first came into home kitchens over 30 years ago when it introduced the now legendary food processor. People discovered that routines could be broken and creative cooking quickly became part of the new lifestyle. Preparing fresh ingredients with products that offered easy and interesting new techniques meant healthier meals and more free time. Today Cuisinart develops products to make every meal memorable. From breakfast toast and coffee to elegant five- course dinners, the preparation and cooking have become a pleasurable part of the total experience. Today’s relaxed lifestyles and the convenience of Cuisinart products make it easier than ever to Savor the Good Life, right at home with family and friends.